'Cause Bieber now we got "Bad Blood"! Justin Bieber inserted himself into the Kanye West/Taylor Swift feud early Tuesday morning, and the world may never be the same. The Biebs posted a screenshot of himself FaceTiming with rapper Kanye West, their joint manager, Scooter Braun, and a pal. 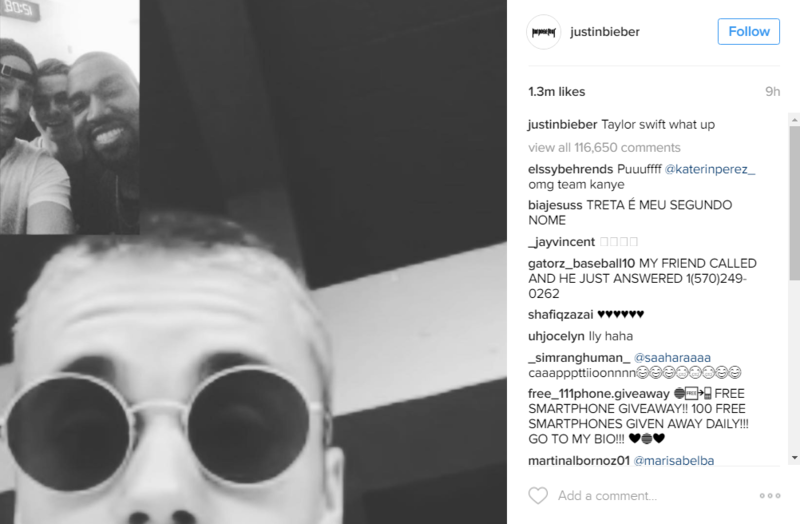 In the black and white Instagram, Bieber is wearing circular shades, and in his caption he served up some shade, writing, "Taylor swift what up." Swift and West have recently had a vicious back and forth on social media after West's wife, Kim Kardashian, released videos of him talking to Swift on the phone. In the clips, which Kardashian posted on Snapchat, Swift appears to be approving the rapper's song, "Famous," which she later publicly bashed. Swift called the clips "character assassination," and slammed the couple for posting them. Bieber's ex, Selena Gomez, quickly jumped to her friend's aid, tweeting about the incident, writing, "There are more important things to talk about... Why can't people use their voice for something that f**king matters?" There have been feud rumors between Swift and Bieber for years, especially after his initial split from her bestie, Gomez. But this past spring, the Biebs posted several videos of himself singing along to Swift's "Teardrops on My Guitar" in the car, which led many to believe that the alleged feud had resolved itself.